Pretty new to glove restoring and wanted to know if relaxing hurts the value of a glove? So would it be worth relacing ? I like to assess the value of the glove first as-is. I personally would not spend a lot of time on an import glove/mitt. A USA made glove in poor condition wouldn't gain a lot of value in relacing. 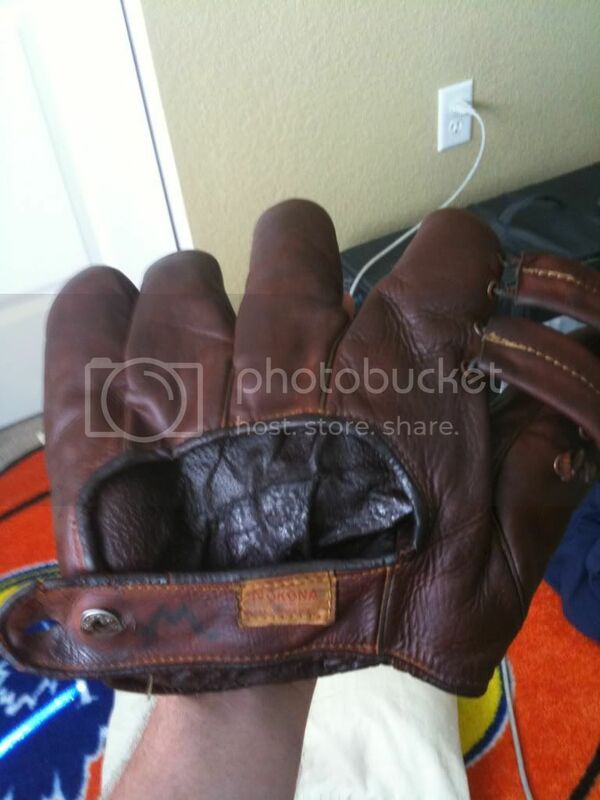 A glove/mitt in good condition with the only issue being a broken lace, then a replacement lacing could help the value. If the glove is for display only and the lacing is intact, then I would just condition it and leave it be. If the lacing is broken or missing, then there are retail and online stores like Tandy that sell lacing that has a vintage look. An older glove looks weird with a modern rawhide boot or glove lace and would not help the value in my opinion. There are various types of needles available to lace the glove, most available on ebay. One style has a handle to pull the lacing through. Another has a hollow end to screw the lacing onto and you can make your own needle with flexible wire for hard to maneuver areas. I have used all three and they all work well depending on the task.